SCVHistory.com | William S. Hart | Boy, 6, at Center of MacCaulley Paternity Swindle (Part I: 1923). Lucy Webb Furigo with son Robert John Webb, who was at the center of a paternity swindle against actor William S. Hart. International Newsreel Photo. Original photographic print, approx. 6x8 inches, from an unidentified newspaper archive. Published June 28, 1923. 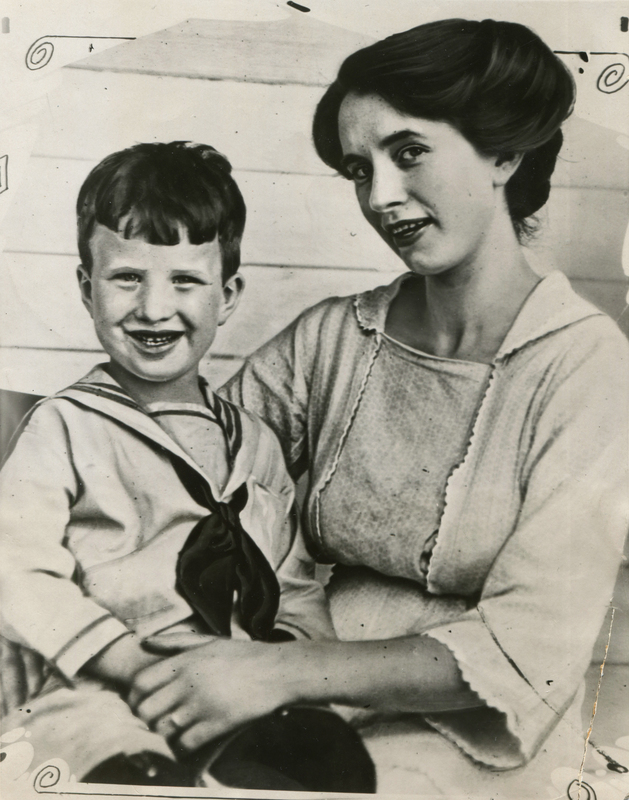 BOSTON ... Mrs. Lucy Webb Furigo is pictures above with her son Robert John Webb, the boy who had been mentioned as the son of William S. Hart, movie star. Mrs. Furigo said that Miss Elizabeth MacCaulley had posed as a wealthy woman and sought to adopt the boy, who is now six years old. 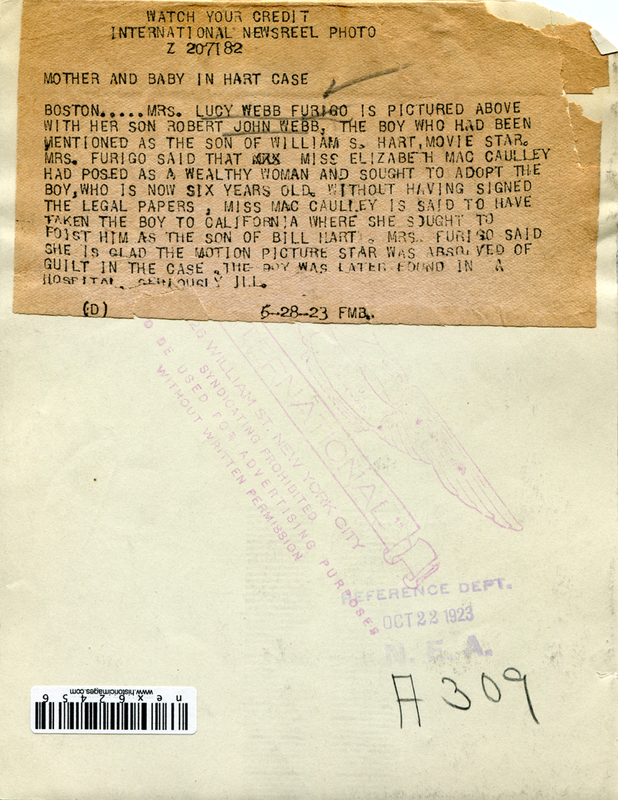 Without having signed the legal papers, Miss MacCaulley is said to have taken the boy to California where she sought to foist him as the son of Bill Hart. Mrs. Furigo said she is glad the motion picture star was absolved of guilt in the case. The boy was later found in a hospital, seriously ill.
As indicated, Furigo was not the person who ran the con. Rather, the perpetrator was Elizabeth MacCaulley, who had agreed to purchase the boy from Furigo (née Webb) in a private adoption but allegedly never completed the transaction. The first half the story, which starts with an awkward encounter in 1916 and takes us to 1923, is set forth below. The episode interrupted Hart's film career and can't have helped his failing marriage. There's a second half to the story in 1938-1939. According to researcher Tricia Lemon Putnam, MacCaulley's real name was McCaulley, but she changed the spelling. The McCaulleys were a prestigious family in Delaware. Elizabeth's father was an attorney, her brother went to Yale, and both she and her sister, Martha, attended Wellesley College and travelled abroad frequently. She didn't go after Hart for the money; rather, she was an obsessed, lovesick fan (a word that derives, appropriately enough, from "fanatic"). Elizabeth and sister Martha eventually moved to California, and both died as spinsters in Los Angeles County, Elizabeth in 1964. Following news articles courtesy of Tricia Lemon Putnam. Riverside (Calif.) Daily Press | March 27, 1923, pg. 1. Los Angeles, March 27. — William S. Hart, two-gunman of the movies, haggard and worn after a lengthy conference this afternoon, issued a lengthy statement to the press in which he mentioned his estranged wife, Winifred Westover Hart in connection with the revealing of accusations of a Boston school teacher, to the effect that he is the father of her unnamed child. "It has been my policy to refuse to answer all attacks made upon me by Mrs. Hart through the public press, or otherwise," the statement said. "Some months ago, when it was stated in the press that documents were being prepared and a suit for divorce about to be filed charging me with physical violence toward my wife, I made a brief statement branding the charges as villainous, malicious, and wicked falsehoods. "Since that time, seven months ago, against all attacks made upon me, I have remained silent. Nor would I speak now except to protect absolutely the interests of my only son. "I deny that I am the father of any child other than my son, born to Mrs. Hart, September 6, 1922. "I deny that I ever made any trust or other provision for the support of any child other than my own son above mentioned. "At the present time, under settlement made May 12, 1922, my wife is receiving from me $19,400 yearly and she has $103,000 held in trust for her. "All this stuff which was printed in a paper here today is false and is evidently given out by Mrs. Hart for the purpose of coercing me and forcing me to comply with her further demands. "My son has $100,000 held in trust for him." The statement was prompted by publication in a Los Angeles paper today of what purported to be charges of a "Miss E.M." said to be a Boston, Mass., teacher, that in 1916 she became the mother of a child of which Hart, the story quoted the statement as saying, was the supposed father. The woman was said in the story to have obtained an agreement from Hart under which he contributed $50 per month to the child's support. This agreement, it was declared, was made after the woman had made a written statement to District Attorney Thomas Lee Woolwine. She was described as the daughter of a former lawyer living in Delaware, and as a Wellesley graduate, now aged 35. The story said she met Hart in Los Angeles after coming to Southern California at the close of a trip with her mother to Denver. Associated Press | As published in San Diego Evening Tribune | March 28, 1923, pg. 17. Los Angeles, March 28. — Detailed denials from William S. ("Bill") Hart, motion picture actor, and his wife, Winifred Westover Hart, screen actress, of charges that Hart was the father of a child born Sept. 3, 1917, to a Boston school teacher, and that Mrs. Hart planned to incorporate the charges in a divorce complaint, became public today. Hart denied categorically the paternity of any child other than William S. Hart, jr., born to his present wife, and declares he never had "made any trust of other provisions for the support of any child other than my own son above mentioned." Mrs. Hart's denial was issued through her attorney, who added, "the incident would have no bearing on the case, even if we did want to use it." Records in the district attorney's office showed a stenographic record of accusations made Dec. 6, 1918, by Elizabeth MacCaulley in the presence of Hart and Thomas Lee Woolwine, district attorney, to the effect she had visited the actor in his apartments here two years previously, and that a child had been born to her in New York in September, 1917. According to Asa Keyes, chief deputy district attorney, Hart although denying the accusation, brought the conference to a close by executing a trust deed for the child, for whose support he agreed to pay $50 a month. Hart's attorney accompanied the actor to the conference, Keyes said. Film Star's Accusation of Part in Baby Expose Branded as "Dastardly Lie"
While Mrs. Winifred Westover Hart was denouncing yesterday an insinuation that she was responsible for an attack on the character of her husband, William S. Hart, the film actor, was issuing a statement in which he denied paternity of a Boston school-teacher's child, and blamed his estranged wife for the charges. The suggestion that Mrs. Hart contemplated bringing the charges in her suit for divorce against the well-known actor was branded by her as a lie at the same time that her husband's statement blaming her was given out. "All this stuff which is printed about me is false," Bill Hart said in the statement issued by his attorney, James G. Scarborough, "and is evidently given out by Mrs. Hart for the purpose of coercing me and forcing me to comply with her further demands." "I have no further interest in the past life of Mr. Hart," Winifred Westover Hart said yesterday. "What he did before he married me is of no concern to me." Sitting in her machine in front of her West Twenty-seventh street home, Mrs. Hart, her voice emphatic and eyes sparkling with anger, branded as a "dastardly, cowardly and despicable lie" the veiled printed newspaper statement that she would probably incorporate in her divorce complaint the charges made public yesterday in which her husband is asserted to be the father of a child born to a Boston school-teacher, Elizabeth MacCaulley. Her mother, Mrs. Clyde Westover, now and then nodded approval of her daughter's condemnation and frequently added a word of suggestion. "I do hope those charges are not true," Mrs. Hart said. "Of course I am not going to charge such stuff in my complaint. Mr. Hart's past, before I married him doesn't concern me, and I couldn't include that in my complaint if I wanted to. I think that the whole suggestion is cowardly and contemptible. I never had any such intention, and couldn't have, for I don't know the woman, and never knew anything about it until this morning." Little Bill squirmed in this mother's arm and patted her cheek with one small hand. His long upper lip and small eyes reflected the image of his father. "If those charges are true Mr. Hart should be made to pay, but if they are not, the woman should be punished for blackmail," Mrs. Hart continued. "But it makes me thoroughly furious when it is implied that I would include these charges of events said to have happened before Mr. Hart and I were married in 1921, in my complaint. "If the truth must be known, my attorney and I have never even drawn the complaint up. I don't believe in divorce and never did. I was raised in a convent and probably absorbed some of that teaching. And if our entire affair had never been made public at first, there might have been a reconciliation." Mrs. Hart paused and gently stroked the sparsely covered head of little Bill, the fuzzy red hair just beginning to show under the white stocking cap. "The charges made by that teacher make out little Bill's father as a rogue," Mrs. Hart said. "It is hard on me, God knows that it is, and it is hard on little Bill here, but thank God he is too young to understand it all. He weighs 21 pounds now and is going to be a great boy when he grows up. "Did I ever hear of that woman? Never. I tell you the first time that I knew anything about it was this morning when I saw the complete story in another newspaper. I haven't the remotest idea who she might be, and I am certainly sorry that such an incident has been brought to the attention of the public. "My only thoughts, if the charges are true, are with the poor nameless child and with the mother, but if they are not the truth the woman should be punished for her accusations." In the statement issued by Mr. Hart, at the office of his attorney, he says that it has always been against his policy to "answer attacks made upon me by Mrs. Hart through the public press or otherwise. "Some months ago when it was stated in the press that documents were being prepared and a suit for divorce about to be filed charging me with physical violence toward my wife, I made a brief statement branding these charges as villainous, malicious and wicked falsehoods," Mr. Hart continued. "Since that time, seven months ago, against all attacks made upon me I have remained silent. Nor would I speak now, except to protect absolutely the interests of my only son." Mr. Hart then declared that everything that had been printed in reference to his asserted relations with Miss MacCaulley several years ago was absolutely false and denied the paternity of any child other than the one born to his present wife, Mrs. Hart on Sept. 6, 1922. "I deny that I ever made any trust, or other provision, for the support of any child other than my own above mentioned," Mr. Hart continued in his statement. "At the present time, under settlement made May 12, 1922, my wife is receiving from me $19,400 yearly and she has $103,000 held in trust for her. My son has $100,000 held in trust for him. All these published attacks have evidently been made to coerce me into paying more money, and this is plainly shown by the following letters written by one of the biggest film producers in the United States, whose name it is not necessary to publish, written to William Grossman, my attorney in New York City." Los Angeles. Jan 12, 1923: "Mr. Billy Grossman. Grossman, Morehouse and Grossman, New York City, N.Y.
"Dear Billy: Mrs. Hart's attorney called me up over the phone and informed me that he have to take action against Bill. I asked him to call on me at my office as in accordance with our conversation, I was anxious to stop any additional foolish and unnecessary publicity on the subject. It seems that he considers the agreement in existence today — quoting the attorney verbatim — 'against public policy,' as the agreement calls for Winifred's getting in possession of the money on the condition that she gets the divorce. Now, the attorney suggests that Bill pay Winifred $150,000, and that will be all the property settlement that she will ever expect with the exception of the money that Bill has settled on the boy. On receipt of that amount her attorney will start action for divorce if it is agreeable and suitable to your client. The grounds for this action will be entirely under your supervision. Please understand that I could not inject myself into this matter for any other reason than of being of service to you. Mr. William Grossman, 1475 Broadway, New York City, N.Y.
My dear Billy: I hope you realize that my intervention in the Hart matter was due to my desire to be of use to you. I know that a man is a darn fool to ever inject himself into anything that is not his business, as his motive may be misconstrued. I am not accusing you of misconstruing my motives, but I am quite sure that Mr. Hart may do so. As far as I personally am concerned, I believe that Mr. Hart has been extremely generous to both his wife and his child in the matter of settlement, and I told Mrs. Hart's attorney so. The only reason for my letter of January 12, was to convey to you just the message given to me by her attorney, more for your information than anything else. It was also learned from an unimpeachable source yesterday that the sum of $50 a month which it is said was settled on the Boston teacher's child for its welfare was executed by certain motion-picture producing interests, who had Hart's interests at heart, and without his sanction or his knowledge. It was also stated from reputable sources that the first time that Hart is asserted to have seen the woman who made the charges against him was when he was confronted by her in the office of the District Attorney. Attorney Scarborough also denied that Hart had agreed to the settlement of any such sum and defied anyone to produce any such agreement with Hart's signature upon it. Mr. Scarborough also said that investigation had shown that the child had never been born to the mother at the place she named nor did the doctor she had named ever attend her. Mr. Scarborough intimated that further sensational developments might take place after a better investigation has been made. "We have been negotiating with Mr. Hart for a year to a year and a half in an effort to get him to come back to the screen, but without success. He has not accepted any offer we have made. If he does appear on the screen it will be on the Paramount program. The last sentence definitely quashes a rumor current yesterday that a tentative agreement between Mr. Hart and the Lasky company had been canceled because of publicity connecting the exponent of western drama with the eastern school-teacher. Reports current in motion-picture circles were to the effect that Mr. Hart was to produce four pictures under the Lasky banner immediately after his divorce suit. The matter was being held open, no contract or agreement having been signed, a verbal understanding taking their place, it was said. For business and personal reasons, Mr. Hart was supposed to be deferring his return to the screen until his divorce. "I can state positively that no agreement, tentative or otherwise exists between Mr. Hart and the Famous Players-Lasky Corporation. And since there is no agreement, it cannot be canceled, of course. Everyone understands that Mr. Hart will come out of retirement sooner or later, but there is no definite reason to suppose that he will be connected with us." Two hours later, Mr. Eyton issued the statement in which he declared that if Mr. Hart returns to the screen, it will be on the Paramount program, allowing the inference to be drawn that an understanding to that effect exists. Mr. Eyton's contradiction of his earlier statement gives rise to the belief that the adverse publicity has not affected Mr. Hart's status with the Famous Players-Lasky Corporation. The statement of Miss Elizabeth MacCaulley, who signed her name as "Betty" to the numerous letters which she is asserted to have sent to Hart, was made before William C. Doran, then Deputy District Attorney, Mrs. Georgia Bullock, Deputy District Attorney, and Arthur J. Hughes, court reporter, Dec. 6, 1918, in the office of the District Attorney. In the statement Miss MacCaulley said she was 35 years of age at the time, was a graduate of Wellesley College and had been an instructor in one of the fashionable schools for girls in Boston. She stated that as she had been intensely[?] interested in drama and its new form, meaning motion pictures. She said she had written to Bill Hart and he had replied with the usual stereotyped form that is usually sent to film star admirers. Miss MacCaulley said that she visited Los Angeles in 1917, coming from Colorado where she had been taking a vacation. Her main purpose was to visit a girl friend, a former schoolmate. While here she called Mr. Hart at the Triangle studios near Culver City. "I have always met people on the stage," Miss MacCaulley said in her statement. "I have met them at studios and at tea and they have a certain amount of manners; he has no manners at all; and they usually have clothes, they like to appear very well and that sort of thing, but he is extremely gruff and very different but the next day I got this note from him asking me to go to dinner with him and his sister Mary. He is homely and looks like a horse and an Indian. I was interested in drama and I was interested in talking with him. "Instead, he watched the people that passed and he looked like a wooden Indian. It never occurred to me that I would see him again. It seemed strange to me that he would invite a person out to dinner and sit there and not see one. When I would communicate adverse criticism, he would turn on me and say, 'How could you ever take such an opinion?' And once in a while he would turn a perfectly charming smile, and then he flaunted his money in front of the waiters and talked quite loud. I noticed most of these things, if you don't, in any actor." Later Miss MacCaulley said: "I am crazy about the man, he stood there and looked like a wooden Indian outside of a cigar store and it struck me so strange that [his] sister Mary was so nice, and I thought she must have an awful life living with him. She said how good Bill was to her and how good he had been to his mother." In another place in her statement Miss MacCaulley said that Hart in one of his replies asked her to write to the Triangle Film owners at New York and tell them what she thought about his pictures. "I thought that he was flattering me and sister Mary says 'He sits up late at night answering these letters,' and I thought that I was one of them." Miss MacCaulley said that following the departure of his sister, Hart called her up at midnight and asked her to dinner for the following Sunday. "That is where it all began. I don't have faith in men, but I have never known them this way, and I don't know a man who is so regardless of conventionalities or anything of the sort. I know he is a highly individual personality. I think that he is about as wild as they make them. He has a lovely side. He makes any statement he wants, he says anything he wants. The first time I was with him I knew that he made a terrible lie that made me feel I couldn't believe a word he said afterwards. People speak highly of his silence, about his wonderful training I felt that it hid him, he used it in the wrong way." Miss MacCaulley said that the relationship continued between herself and Hart until the end of January when his sister came home. About a month later she returned to the East and later learned of her condition. Letters which she stated were written to Hart by her were ignored by him when she endeavored to communicate with him during his visit to Boston on a Liberty Loan campaign tour, he refused to speak with her, according to her statement. No letters were ever received from Hart after she left Los Angeles, Miss MacCaulley stated. After the birth of her child on Sept. 3, 1917, Miss MacCaulley said she returned to Los Angeles. Repeated letters to Hart had remained unanswered, she said. Her mother, Miss MacCaulley said, was shocked when she told her she had met Bill Hart. "She said he was dreadful, but in spite of all that I think that he is fascinating. I don't think that I am insane; I admit that I might be crazy." Regarding financial settlement for the care of the child. Miss MacCaulley said that the $100 a month which she received from her mother was not enough. "I am not foolish about money. I don't think that it has anything to do with happiness or anything of that sort, but I had thought if I could take an apartment and bring that child in and have it in my own home where I could watch it, where I could have it trained and well educated, that was my right legally. It looks to me as if he owes me assistance and protection too." Miss MacCaulley then detailed her final conversation with Hart in which he is asserted to have hung up the telephone receiver, abruptly terminating the conversation. "He said: 'I don't see why I should.' Then there was a silence and he had disappeared from the telephone, quietly putting up the receiver." Miss MacCaulley said it was that incident that determined her in visiting the District Attorney's office, as she had no money with which to hire a lawyer. Special to The News Standard. Boston, March 29. — Winifred Westover Hart, pretty blonde wife of William S. Hart, is responsible for the revelations of the tragic love story of Elizabeth MacCaulay [sic, s/b MacCaulley], Wellesley graduate, who charges the screen idol is the father of her 5-year old son. Due to the efforts of the young wife to unearth evidence for her divorce suit, this tragedy, which the cultured woman believed hidden forever, has been dragged into the light. "I have been crushed between the wheels," said Miss MacCaulay. "I am the victim of the domestic troubles of Bill Hart and his wife who wants his money. My terrible story would never have been revealed had it not been for Mrs. Hart's effort to get evidence for her divorce suit. "I thought my story was safe. I never dreamed it would be flaunted before the world to my shame and the shame of my family. And, it seems ironic that it should be tossed to the winds by a woman who wants to blacken the name of a man I once loved." "I have drunk the cup of sorrow to its bitter dregs. And bitterest of all is the realization that after all my grief the man I loved was not what I believed him." She said she had attempted to see Hart in Los Angeles and he refused. "When I discovered my condition," she said, "my first impulse was to go to him. I felt he would help me. "I went to his studio and asked to see him but he refused to give me a chance to share my terrible secret with him." She said she was bewildered by the problems that beset her and was unable to make a definite plans. She faced the painful necessity of informing her brother and sister, both of whom are eminent in intellectual circles. Her sister, Bertha [sic, s/b Martha], was formerly dean of women at St. Louis University. She is now in Europe. Her brother, Maj. Samuel White MacCaulay, is a well-known Chicago engineer. Los Angeles, March 28. — Detailed denials from William S. Hart, motion picture actor, and his wife, Winifred Westover Hart, screen actress, of charges that Hart was the father of a child born September 3, 1917, to a Boston school teacher, and that Mrs. Hart planned to incorporate the charges in a divorce complaint, became public yesterday. Records in the district attorney's office showed a stenographic record of accusations made December 6, 1918, by Elizabeth MacCaulley in the presence of Hart and Thomas Lee Woolwine, district attorney, to the effect she had visited the actor in his apartments here two years previously and that a child had been born to her in New York in September, 1917. Elizabeth MacCaulley, Who Accused Actor Says She Only Wanted to See Him. Boston, May 24. 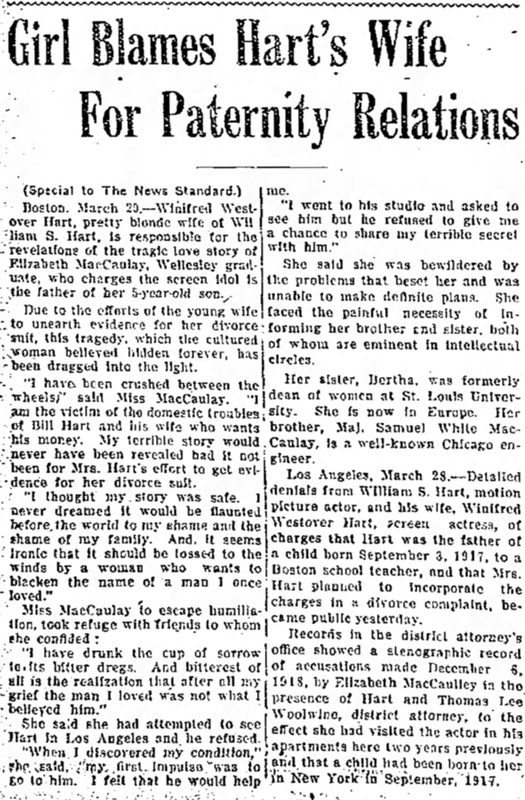 — Miss Elizabeth MacCaulley, who charged recently that William S. Hart, motion picture star was the father of her baby, admitted in an exclusive statement to the New York American tonight that she had borrowed the child from another woman, and that her charge against Hart was totally false. Miss MacCaulley, a middle-aged Brooklyn woman and a graduate of Wellesley college, said that the whole idea of trying to foist a child on Hart was only an irrepressible and unrestrainable effort of a woman to win a man's heart. The baby, which was taken before the prosecutor at Los Angeles, under the name of "Rupert Leigh," and declared to be her child by Hart, is in reality the son of Mrs. Lucy Webb, who lives in a suburb of Boston, Miss MacCaulley confessed. "It is true that I never bore a child to Mr. Hart," said Miss MacCaulley. "I have got myself into a terrible mess. I never wanted to hurt Bill Hart. I never dreamed this would become public. And I have a reason. It might not mean much to you but it means everything to me. "He would not see me and I wanted to force him to see me. That is the reason. There was a misunderstanding. He was determined not to see me and I was determined that he would. It was a battle of wills." Miss MacCaulley is past 40 and her hair has been gray since she was 26, she said. 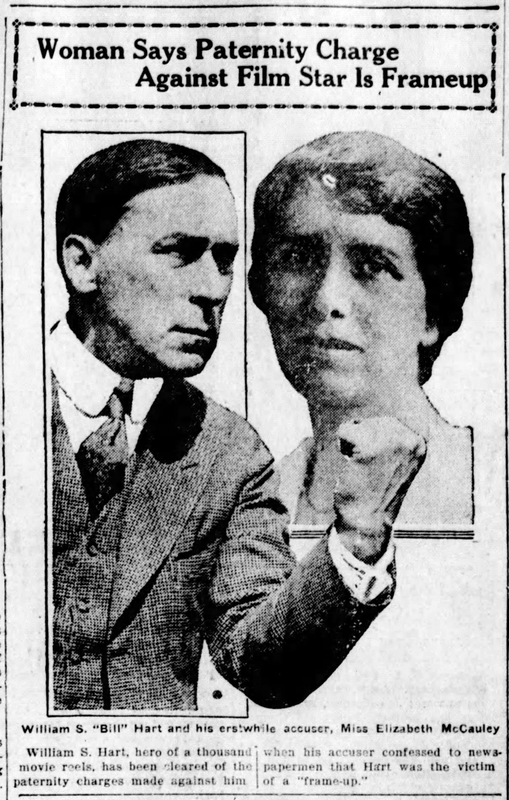 It was in 1917 that Miss MacCaulley first made her charge against Hart, but the matter did not become public until Hart was separated from his wife, Winifred Westover, also a movie star. International News Service | As published in San Diego Evening Tribune | May 25, 1923, pg. 27. Los Angeles, May 25. — William S. Hart, "two gun" man of the movies, today declined to comment on the statements of Miss Elizabeth MacCaulley of Brookline, Mass., a Wellesley graduate, exonerating him of her previous charge that he was the father of her child. "I would like to say something," Hart said, "but the matter is entirely in the hands of my lawyer, J. H. Scarborough." Hart said he planned to see his attorneys as soon as possible. "Then I hope to be able to say something," he added. Hart was roused by a reporter who called early at his home. "Miss MacCaulley fully exonerates you of the charge of being the parent of 'Rupert Leigh,' the baby for whose maintenance you are now said to be paying $50 a month." Hart was told. "I'm sorry I can't say a word until I see Scarborough," Hart replied. Miss MacCaulley made her remarkable retraction in Boston. According to dispatches from that city she confessed the child was not even her own — that she had borrowed it from another woman as part of a desperate plan to force Hart to see her. "He would not see me and I wanted to force him to see me," Miss MacCaulley said as she broke down in tears. "That is the reason. There was a misunderstanding." Her confession came after she had been confronted with evidence that the child belonged to another woman. In an amazing confession, Miss Elizabeth MacCaulley, of Boston, graduate of Wellesley and middle-aged teacher in a private school, has absolved William S. ("Two Gun Bill") Hart of the parentage of her child — a child, by the way, she never bore. Miss MacCaulley created a sensation by charging Hart, whose otherwise scrupulous life had been without reproach, with being the father of the child. Now, she has confessed she never bore a child, but partly adopted one, and that love for Hart and desire for a child inspired her story. Although Hart’s wife, the beautiful Winifred Westover, has left him, she never believed Miss MacCaulley’s story. Hart was so broken up over the woman’s unfounded charges, which he characterized as a "frame-up," he had refused to make a picture until his name was cleared. By William G. Cayce, International News Service Staff Correspondent. (As published in) The Ogden (Utah) Standard Examiner | May 27, 1923, pg. 2. Los Angeles, May 26 — Breaking the silence he had maintained for 36 hours, William S. Hart, famous two-gun hero of the movies, today in an exclusive interview with International News Service declared he had only sympathy and sorrow for Miss Elizabeth MacCaulley of Boston, Mass., who has retracted her sensational charges that he was the father of her six-year old boy. With tears in his eyes the famous portrayer of western roles on the screen declared that from information he had received from Boston, he knew Miss MacCaulley must be suffering — suffering as he had suffered before the charges against him had been cleared and her statement completely vindicated him. Hart said his sympathy went out to her in her hour of distress. "I know Miss MacCaulley must be suffering as I have suffered and she needs not suffer more," the actor declared in a broken voice that came between heavy gulps. "I have no intention of bringing any action against her. It is a case for God — the highest court. The whole thing I want to consider a closed chapter. I never hit a woman when she was up and I am certainly not going to hit Miss MacCaulley now that she is down." Hart declared he first knew of Miss MacCaulley in 1916 when she wrote him "fan" mail and he was starring in films. Her letters arrested his attention, he said, because of her flawless English and led him to believe she must be a woman of unusual intelligence, he said. "In December, 1916, I met her in person. When I returned from the studio one evening my sister told me the woman who had written me such fine letters from Boston was in Los Angeles and had called by the phone. I suggested that she be invited out for dinner which my sister did. When she came to the house was the first time I had seen her. "Only once did I see her alone. That was a night or so later when I took her to a local café for dinner. We were together then about two hours and I left her with friends who had been with her when we met that evening. After that I saw her a few times, certainly not more than three or four times. As I went to work I met her as she was walking with her dog about seven in the morning near Westlake park. I would be passing in my machine and would draw in to the curb to chat with her a few minutes, and would leave the motor running. She used to object to that, I remember, and tell me it was not very courteous. "I realize now the woman must have had some sort of weird attachment for me, but as far as demonstrations of affections on either of our parts, there were none," he said. Speaking firmly and without hesitation, Hart declared he never knew that a trust fund had been provided for the boy which Miss MacCaulley claimed was his. However, he admitted that this might have been arranged by other persons who had money invested in his films and had rather pay the money than have the undesirable publicity. The thought that the woman brought the charges against him for the purpose of wringing money from him never entered his mind, Hart said. "Why — why?" and tears came to his eyes as he leaned forward and in a cracked voice went on. "Would I hesitate to care for the child if he were mine, when under the California law he would be a more direct beneficiary than my own dear son." He paused here. His face writhed in unmistakable pain as he recalled the separation from his own wife and child. As for his future plans. Hart said he had none at present but that he has a standing agreement with a local producer that when he does re-enter pictures he will do so for him. Found Child Near Death in Hospital When Miss McCaulley Was Through With Him, Mrs. Furigo Says. By Ruth Dayton, Universal Service Special Correspondent. (As published in) The Indianapolis Star | May 28, 1923, pg. 1 & 3. Boston, Mass. May 27. — "Elizabeth MacCaulley tried to victimize William S. Hart. 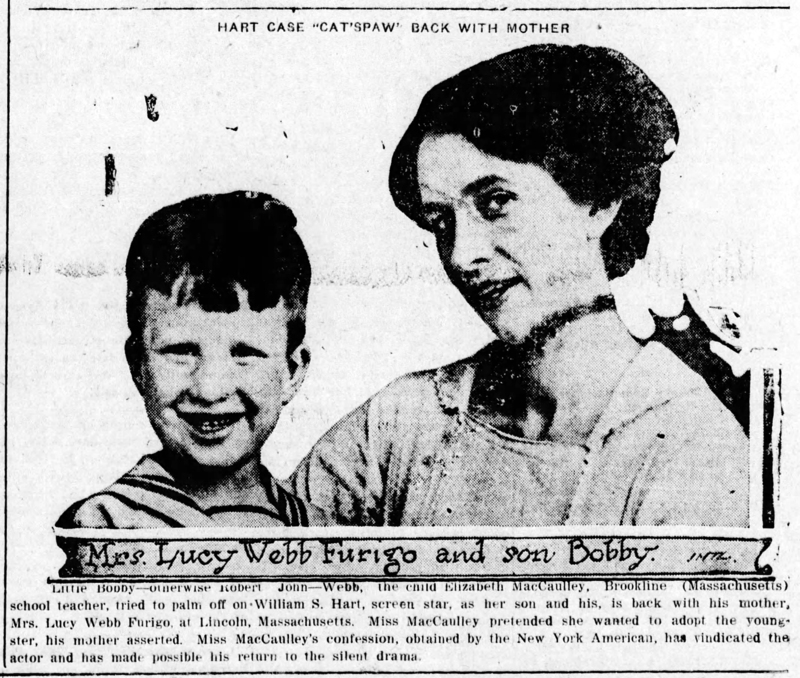 She did succeed in victimizing me and when I received my child back I found him in a hospital desperately ill."
Mrs. Lucy Webb Furigo, actual mother of "Bobby," the baby boy whom Miss MacCaulley tried to palm off on "Two Gun Bill" Hart as his own son, made this statement tonight. "Posing as a wealthy woman, Miss MacCaulley went through all the motions of adoption except to sign the papers," said Mrs. Furigo. Then borrowing him on probation she fled to California to foist him off on 'Bill' Hart. When I recovered 'Bobby' he was in a hospital at Cambridge, nearly dead from water on the brain. The doctors had a hard time saving his life. Mrs. Furigo was found in Lincoln, Mass., on the country estate of Henry L. Higginson. She is employed there as a maid, and her husband as a butler. She received me on the porch of her little home. Six-year-old "Bobby," the now famous bogus baby, stood by her side. "Oh, no you're not. You've been too near the movies already." "I am so thankful that Mr. Hart is cleared of the terrible charges brought against him by Miss MacCaulley. Words can't express my rage when I saw Miss MacCaulley's picture in the newspapers and realized for the first time what my innocent, little baby had been used for in Miss MacCaulley's scheming." Then she detailed how Miss MacCaulley obtained temporary possession of "Bobby." She was having a hard time in 1918, she said. She was boarding "Bobby" out and decided to let someone adopt him so he would have a better home and advantages. She looked in the papers and found an advertisement by a woman who wanted to adopt a boy a year old. She answered the advertisement, received a reply and made an appointment with Miss MacCaulley. "When Miss MacCaulley saw 'Bobby' she seemed to like him very much and said she would love to have him." Mrs. Furigo continued, "She said she was glad it was a little blonde baby. Now I understand this. "I had no reason to doubt that Miss MacCaulley was a fine woman. She appeared very sympathetic and loveable. I was much impressed with her learning, and well I knew when I read the papers two months ago about Miss MacCaulley, a Wellesley graduate who was charging William S. Hart with the paternity of her son that it was the Miss MacCaulley who had borrowed by child and that my 'Bobby' was the baby she said was hers and Bill Hart's. I was stunned to think of the terrible thing that was done by using my child without my knowledge." Mrs. Furigo detailed the preliminary and routine events leading up to what she thought was the adoption of "Bobby," and how Miss MacCaulley left for the West with the child the latter part of 1918. She said Miss MacCaulley went for more than a month at a time without writing to her. During one of the long waits she wrote Miss MacCaulley a letter to her Boston address and it was opened by the latter's mother, now dead, who became greatly excited. In January, 1919, she received a post card from Miss MacCaulley which read: "I shall probably be away longer than I at first expected. Living in mild sunshine daily — lovely — and good for my friendly little traveler." It was during this period, from November, 1918, until the following March that Miss MacCaulley was in Los Angeles playing the part of a sweet gentle mother who had been deserted by the father of her child. The climax of her stay in Los Angeles came when she convinced District Attorney Woolwine that Hart was the child's father and the attorney forced Hart to face Miss MacCaulley in his office. In tears she faced the movie star, assuming the attitude of noble forbearance toward the man she said was the father of her nameless child. Although Hart stormed and raved, he was helpless and Miss MacCaulley's story was believed. While the meeting was in progress, the baby was in an adjoining room. With sobbing entreaties, Miss MacCaulley implored Hart to at least take one look at "our little darling." "Not a nickel will I pay for the support of another man's baby. I am not the man who is the father of this baby. That hotel clerk you knew at Grand Canyon is its father." This accusation was a blow to Miss MacCaulley. Hart and his attorneys sought to prove Miss MacCaulley was an imposter. Miss MacCaulley returned East and returned the child to its mother. "In April, 1919, Miss MacCaulley telephoned me to meet her at a hospital. She had my poor, little baby boy who was desperately ill. She told me to formally enter him in the hospital, thus avoiding attaching her name to the records. She told me she could not adopt the child because of its physical condition but said she would pay the hospital bills. The child was in the hospital four weeks and Miss MacCaulley refused to pay the bills. I paid them." William S. "Bill" Hart and his erstwhile accuser, Miss Elizabeth McCauley [sic]. Explains Casual Meeting With Miss MacCaulley. By Don H. Eddy, Universal Service Special Correspondent. Los Angeles, Cal., May 27. — "She's been punished enough." 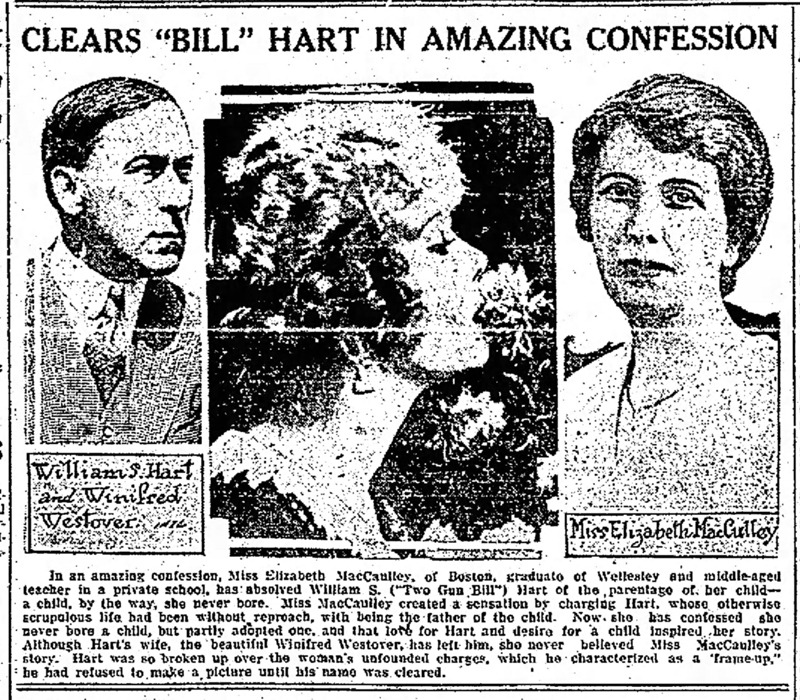 Bill Hart, hero of the movies, reiterated this sentiment again when he discussed Elizabeth MacCaulley, the girl who charged he was the father of her child, then "came clean" after months of waiting and confessed it was only a child of her brain. "You newspaper fellows put me at a disadvantage," he said in his easy drawl. "I feel like talking my head off and I don't know what to say. "When I woke up the other morning and read about that woman's confession, I tell you, I felt like a man reborn." "Here I was already wandering around in hell, and they went and turned out the lights on me. And what I went through—"
His voice trailed off into silence. He seemed embarrassed by the very depths of his emotion. He swung out of the car and stood on the drive, looking down over Hollywood and away into the purpling distances of the far mountains. But he seemed to see beyond them. "You know," he said after a while, "it had me going for fair." His voice was low, almost indistinct. "It finally got to the place where I could not sleep. For five nights I never blinked an eye. Finally I got to starting out at 3 o'clock in the morning and doing a lot of road work. Then I'd take a hot bath and sleep a little through the day." After a little while he took the writer through the house, profuse with Indian rugs, up the stairs where a gorgeous saddle graced the landing, and into his bedroom with its Indian pieces and rugs. He sat on the foot of the bedstead. It was then that he told the story of his association with Elizabeth MacCaulley. "She was one of the first Bill Hart fans," said Bill, talking so rapidly his drawl got all mixed up. "A long time ago, when I used to answer my own fan mail, I got a glowing letter from her. We used to talk about them — my sister Mary and I. I never had a college education. I didn't really understand how perfect, rhetorically, they were. But Mary went to college — she knew. "'Invite her out to dinner.' So we had dinner — the three of us. "Then Mary went abroad and on the day she sailed she got a great big bunch of flowers from the woman, and Mary made me promise to thank her personally. What could be more natural than to invite her out to dinner? I did. "But I also invited her to bring some friends, and here they came on the appointed night, a whole automobile full of them. As I remember, there were a doctor and his wife, and a lot of children, maybe a half dozen. But Miss MacCaulley said the others were not going to dinner, so she arranged to meet them in about an hour. We went and had dinner and went right back to where these people were and I didn't see her again for a long time. "But she lived somewhere up on Orange street with another girl. As I used to drive up Orange street on my way to work, she would be outside leading her dog up and down on a leash. She'd wave. I'd stop and talk for a minute. "I suppose that happened maybe half a dozen or a dozen times. And that was absolutely the extent of my relationship with her. "So I reckon you can imagine my feelings when about five years ago, she first started this campaign against me. Four nights running, they had me up in the district attorney's office — not putting me through the third degree or anything, you understand, but just talking to me. It nearly drove me crazy. "'Mr. District Attorney, you can do anything you want to with me. I'm like a trussed deer. But you can't make me, and nobody on earth can make me pay that woman one bean, no, not one nickel. Because she's wrong!'" "And that was the way it was left. "That was bad enough. But when it came out in the newspapers here awhile ago, well—"
He said he had not made any plans about going back to work, there had not been time enough to let him get his ideas in shape. He spoke of money. "All my troubles cost me $553,000, and some odd beans besides, last year. Think that over. I can't keep up that pace very long." An attempt was made to verify growing rumors that Bill intends to clear up all his difficulties at once by instituting divorce proceedings against Winifred Westover Hart, his wife. He grew excited and somewhat incoherent in his nervous tension. "I'm not going to say anything about that," he said. "I can't talk about my matrimonial affairs — they're mine — my own — I can't talk about them. Don't ask me." Little Bobby — otherwise Robert John — Webb, the child Elizabeth MacDaulley, Brookline (Massachusetts) school teacher, tried to palm off on William S. Hart, screen star, as her son and his, is back with his mother, Mrs. Lucy Webb Furigo, at Lincoln, Massachusetts. Miss MacCaulley pretended she wanted to adopt the youngster, his mother asserted. Miss MacCaulley's confession, obtained by the New York American, has vindicated the actor and has made possible his return to the silent screen. LW2718: 19200 dpi jpeg from original photograph purchased 2014 by Leon Worden.